No More Wasteful Cleaning Cycles! The best way to clean your washing machine is to use a washing machine cleaner that can be used with laundry to clean the entire tub. The added bulk of clothing will raise the water level to include the splash area just above the normal waterline where suds and soiled water are deposited. 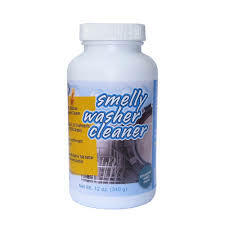 Smelly Washer Cleaner has been improved to an amazing dishwasher cleaner. 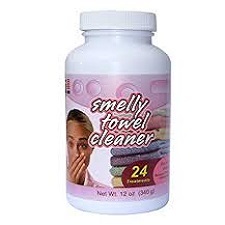 We also created Smelly Towel Cleaner to make your laundry fresh and clean while keeping towels fluffier and more absorbent without using fabric softener. Our customers love it! Both products are all natural and provide 24 Treatments. That's enough for up to 1 YEAR of fresh and clean appliances and laundry! This new Dynamic Duo will safely and easily maintain freshness by adding a tsp with your detergent monthly or when odor is noticed.